Some of you may already know about this as it's caused quite a controversy but I just found out that google is no longer going to support Google Reader. I'm a little confused. I'm a big fan of google and all they do. I love gmail. drive. maps. blogger. (obviously) I used to use igoogle but they announced last year they're getting rid of that too. They're really innovative. Google Glasses. Fiber. Google's self driving car. So cool! So I don't understand the deal with dropping reader. Maybe it's a social experiment to see how people react which so far isn't good, haha ;) Their stocks are dropping. Petitions are popping up, people are going nuts. It's definitely causing a frenzy. Anyway, there's an article about it here if you want to read about it. It seems like it all comes down to popularity? Sure, just a few hundred thousand people use it but I guess that's not enough..? Or maybe the bottom line is money. I don't know. I just was curious how many of you this will affect? How many of you use goole reader on a daily basis? I'm not sure what alternatives there are out there. Google Plus? I'm still not really quite sure what Google Plus is, heh. Wall Street Journal posted some alternatives to reader so you can check that out! Would love to hear your thoughts about this! Feel free to discuss it in the comments! I totally do not understand the benefit/reason they would drop it! i do not always use it to check up on blogs, but i have their app and i like it for that. who knows....thanks for posting this. It's definitely affecting me since I use Google Reader EVERY DAY. I'm trying out Feedly and it's not too bad actually but still I'm so used to Google Reader. I use google reader and my heart sank when I got the message this morning after logging in to ready my daily blogs. I have to say google was already treading on thin ice before this, but taking reader away might be the last straw for me. I think the reason they are dropping it is to get people to use google+ (the alternative to facebook that isn't doing so hot). I'm moving over to bloglovin, but will still miss my reader. I'm a GFC and reader user!! This is sad news for my blog following! Why do they have to change a good thing?! I was so surprised when I logged in this morning! I guess it's good to get out of my comfort zone though and try something new. I had signed up with feedly a few weeks ago, it seems like it's really well done, so far I don't think the transition will be very difficult at all. I'm sad to see it go. I use it every day, multiple times a day. I wish they'd integrate features of Reader into Google+ - that'd make me use Google+ more. I was so upset yesterday when I found out, but then a friend suggested Feedly, and I've got to say that so far I actually like it. You sign in with your Google account (which won't be an issue once Reader is gone), all of your feeds are auto-imported, and the interface is beautiful. The press release said Google was trying to simplify their products and make room for new things, but I'm definitely sad to see Reader go. It changed the way I used the Internet. I don't use reader directly anymore, but use the "Next" button that you can put into your bar and LOVE that. Sad. But I'm always up for trying out new things. Will try bloglovin and feedly since commenters seems to like them. I'm so bummed about this. I use my Reader everyday. The hardest part will be losing all of the tagged recipes that I have saved over the years (before Pinterest existed). I use Flipboard on my phone and am checking out Feedly on my laptop. I really hate to lose all of my saved recipes. It saddens me that Google Reader is vanquishing in July. I've heard that there are other alternatives. Which one is better? So far the commenters gave Feedly positive reviews, maybe I would try that out! I love google, but never used google reader... I started using feedly right when I was looking for a feed and I love it :) I highly recommend it! I let out a huge 'Awww man!' when I saw that this morning. One of the fantastic bloggers I follow in the cookie decorating world put together an awesome and super easy tutorial on switch over to Bloglovin' for anyone interested. I did it and am a super happy convert! The Bloglovin' app is cute and I love the easy format. If you're on the hunt for a replacement reader, it's definitely got my vote! It's what I use on a daily basis to keep up with all my blogs. It's one of the few things I still use on google. I guess they played too much ping pong in the corporate office. Not a pleasant surprise when I signed in today! I'll be trying out Flipboard - they say you can log in and it will automatically grab what is in your Google Reader. I'm shocked also, to hear about Google dropping Reader! I've used it for years, and will miss it's efficient simplicity. I'm looking into other feeder options, and will have to start transferring my starred posts to my Pinterest boards. I'm really sad to see it go! I'm trying out Net Vibes today and I love it so far. You have the option to use it as a reader only or combine it into a reader and social media/email dashboard. The view is identical to Google Reader but you also have many more options. I am sad to see Reader being discontinued, I use it almost every day. I'll have to find other feeder (feedly maybe). Google + isn't really the same as reader, closer to facebook (I prefer it to facebook). This is the worst news. I obsessively click my Google Reader "next" button to sift through all the blogs I read. I'm not sure that I'll remember to keep up with them without Google Reader. Not to mention the fact that I'll probably lose all the subscribers who read my own blog that way! They should be giving up on crappy Google+ instead of Google Reader. Some folks are switching to Feedly. I'm not going anywhere yet. If only a few hundred thousand people use it, everyone I know must be contained in that "minority" because I can't think of anyone (other than people my parent's age or older) that don't use google reader. My own blog is a wordpress, hosted on my own site, so I don't use blogger, I only set up a gmail account since I'm always in google reader anyway. I am still recovering from when bloglines said they were closing. That was why I finally moved over to google reader. Then last minute someone came in and bought out bloglines, but it was too late. I had already started fresh. What I don't understand is why they would shut down something useful and appreciated like google reader, but keep trying to push google+ when everyone knows that the only people that use it are google employees. I started wondering if there was some greater agenda to this. Like, maybe people are more inclined to click on ads (google ads) when they manually read a blog, as opposed to read it in a RSS subscriber. They realize they can make more money from advertisers if they get rid of it. The only problem with that is that people WANT an RSS reader, so whether they are using google reader or not, they will find something else. THERE IS NO WAY I AM GOING BACK TO JUST BOOKMARKING BLOGS. No way! Thank you so much for blogging about this, Dani! I was upset when I saw the notice about Google Reader going away. I use it multiple times every day. I'm not very technically-savvy, so making a change to something else is something I dread! But thank you for inviting people to post about it. I'm looking for advice from people who are smarter than me, and I've already taken notes on recommendations from fellow posters here. Thank, guys! I hope in the end, that Google changes its mind about getting rid of Google Reader and I won't have to switch to a different reader. I've migrated to Feedly. I liked how getting all my google reader content was as easy as clicking a single button. All my "starred" items have come over, so I'm not out anything I was saving for posterity. I like the way Feedly looks. Also, I dragged the icon for it up to my menu bar, so I just have to click it to see my RSS feeds. YAY! Stupid Google! Fie on them! I usually use Google Friend Connect and I didn't realise that it would disappear too. I already follow some blogs on Bloglovin so I just imported all the blogs I follow to there. It's really easy, they have a link at the top of the page at the moment. I'm pretty much having an anxiety attack over this. So happy to see your post, I'm going to check out the recommended sites like Feedly? I use it 20+ times everyday. I am still upset about it :( I rely heavily on it. I'm going to read through the comments here and see what the next best option is. Thanks for starting the conversation!!! so sad to see it go. :( i've been testing out feedly also. I'm bummed! But it sounds like Feedly might be a good option. I'll need to check it out! I don't know why Google keeps trying to get rid of their programs. I've already switched over to Bloglovin. 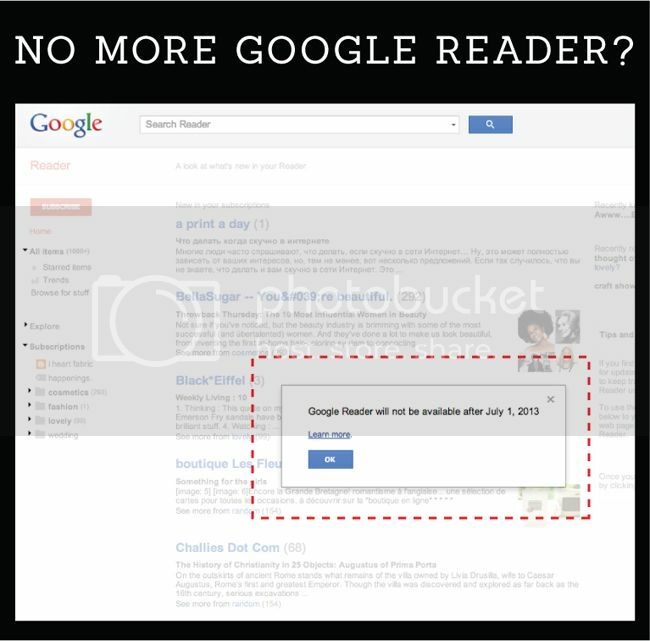 i've always used google reader. i'm sad. I am so bummed about this. I am going to move to one of the reader alternatives (NOT Google plus...I'm not looking for social interaction, just a way to read blogs). I use google reader and is so comfortable to me use it! I signedup in bloglovin, but send you to the real blog, and like it more Reader way. The pictures in reader are bigger and like that. Only click when cannot see the post and when I want comment like right now. I used to use Google Reader, but didn't like that alot of the blog posts would only come up as abbreviated versions and that you didn't actually see the blog layout. I use bloglovin' now and like it alot better. I use Google Reader everyday so I was sad! I already had a Bloglovin account but I don't really like it. I couldn't seem to find the option to see full posts or sort from oldest to newest. I've tried out Feedly to give myself time to get used to it, and it seems like the better option. Clean design, so that's a plus for me :) Plus, it also transferred over my starred posts, which was what I was worried about! Still using Reader for now though... I will miss it! C'mon Google! I'm still ragging about this. Google Reader is one of the only tabs (along with Gmail) that I keep open and check all day. I'm looking into checking out Feedly, Pulse, or Bloglovin. To mohaus - you should be able to save all of your starred posts with the Google Takeout tool. You shouldn't have to loose anything. I might be starting fresh and just going through all of my starred items and pinning them to Pinterest as well as an added backup. I don't think GFC is going anywhere though. They dropped the service for non-blogger blogs last year, but I haven't found anything indicating it's going down with Google Reader. I am so disappointed!! I use google reader every day to keep track of the blogs I follow, if I have to have a look at every one of them to know if there is a new article published, it will take ages! Add me to the list of the disappointed. I went through this with Bloglines when it shut down. I switched to Google Reader then. Shortly after, Bloglines reopened, but I stuck with Google. I might go back to Bloglines. I used Flipboard on my iPad, but I don't use my iPad exclusively, so I really depend on Google Reader. I guess I'll see how it plays out and make a decision as July approaches. Super frustrating. I love Reader!!! I love google reader. :( I've moved over to The Old Reader, which has the features google took away in 2011, like sharing articles to your friends/followers right within reader, commenting on them, etc. Its so awful and annoying! Not too impressed with this. I first found out when another blog, adore-a-polish, posted about it. I've mostly subscribed to blogs via email but there are a few which don't have this option, as well as CBC Radio feeds which are RSS only. I'll have to find another reader and transfer everything over before Google Reader gets the axe. I actually like bloglines.com way better! I switched to Feedly. It's great. i was devastated! i petitioned when the removed Sharing, now removing it all together breaks my heart even more! feedly and theoldreader.com are pretty good alternatives. Makes NO sense to me, but now I have an excuse to move everything to BlogLovin, which I also like but never needed to use. Google reader was just so clean + simple! I think I will miss it. i also use Google Reader daily and i don't know what I'm going to do without it!! :( Cries. I'd love to hear which alternative people prefer! I switched to Feedly a few years ago and haven't looked back. To all of your commenters who have suggested it (and love it), believe it. I don't even miss Google Reader. Lovers of information now seem to have a tough time with the recent announcement of the closing down of Google reader. However, fans of Google reader can now switch to something new alternatives to Google Reader. I found list of some alternatives of it, but still can't decide that with whom should I go for best result. Now, here its a brief description about some other alternatives, so now its not a very much difficult task for me. Thanks for helping out on above topic. My reaction was "WHAT. THE. HECK."